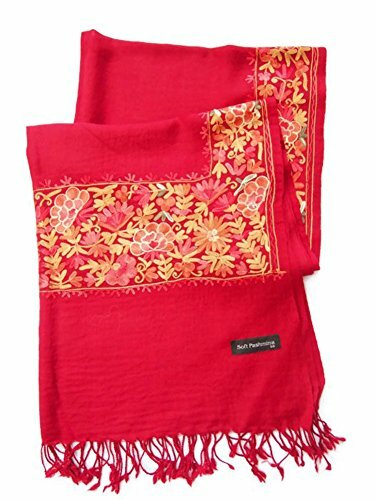 India Handmade Embroidery - Premium Soft Pashmina / Kashmir - Dark Red with Multicolors Flora - 80'' X 27'' Wraps / Scarf / Scarves / Shawl / Tablecloth / Home Decoration by SukSomboonShop at Thai City Deals. MPN: Hypernova-B-NOTE3-5002428. Hurry! Limited time offer. Offer valid only while supplies last. Suk Somboon mean happiness and prosperity. SukSomboonShop is started because I believe in beauty of life. I love beautiful things and accessories. Handmade from India. Measure = 80 inches x 27 inches, Weight = 330 Gm. Sofa Set !! 1 Table runner + 4 Cushion Shiny Green King Elephants Beautiful Thai Silk Blend Table/bed Runner Size : 20 Inches X 2 M.